Notification of cancellation must be received in writing. We provide the following cancellation policy: On or before June 31, 2017: Full refund of deposit amount ($500 USD per person). July 01, 2017 to January 15, 2018: Up to 50% of tour cost. After January 15, 2018: Up to 100% of tour cost. In the event of cancellations, we will endeavor to find a replacement, in which case, arrangements can be made for partial refunds (amount to be determined as a case-by-case basis). Beqa Lagoon Resort (pronounced “Benga”) is situated on six acres of lush, tropical gardens and beachfront. There are 25 deluxe, spacious (430 square feet of floor space), air-conditioned rooms (bures), each one with its own private deck and gardens. Our accommodations for the tour will be in the beachfront bures, each that also include a private pool and views out onto the tropical blue sea. World-class cuisine is expertly prepared by internationally trained chefs and served in an open-air veranda. The resort has luxury spa treatment facilities and a full service SCUBA dive center with their own fleet of speed boats. Please click here for more information about Beqa Lagoon Resort. All images of Beqa Lagoon Resort were supplied by Beqa Lagoon Resort. 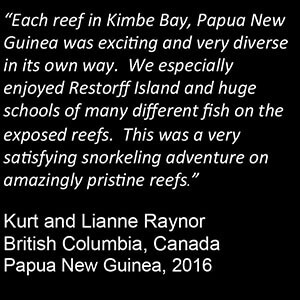 Please contact us to reserve your spot on our special Melanesia, 2018 snorkeling tour!